The Triple P – Positive Parenting Program is an internationally recognized program that equips parents with the skills and resources they need to successfully manage challenges in the family. Triple P Stepping Stones focuses on the specific challenges faced by parents of children who have a developmental disability. Our certified Triple P Practitioner meets with parents in their own homes to discuss strategies, while providing them with a number of helpful tools and resources. Stepping Stones Level 3: Primary Care; a 2-month in-home program where parents meet privately with our certified Triple P Practitioner to develop strategies to deal with a child’s challenging behaviours. 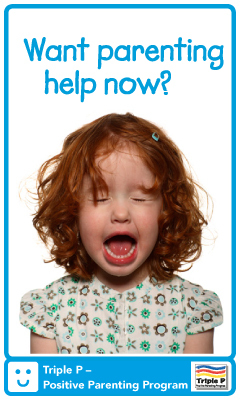 Stepping Stones Level 4: Standard; a 6-month program that equips parents to deal with more serious behaviour problems. This is also a private, in-home program. Teens Level 3: Primary Care; a 2-month in-home program where parents meet privately with our certified Triple P Practitioner to develop strategies to deal with a teenager’s challenging behaviours. Triple P Level 5: Enhanced; A more in-depth program for parents of children with concurrent child behaviour problems and family adjustment difficulties, e.g. parental depression or stress and partner conflict. This is for parents who have attempted a Level 4 program and didn’t see the improvements they were looking for. For more information, email triplep@ddrc.ca, visit the Triple P Stepping Stones website, or refer to these Frequently Asked Questions.